Formulated specifically for unique conditions found in marine environments, with full synthetic formula for maximum engine protection in all brands of 2-cycle PWC’s and Sport Boats. Inherently biodegradable, clean burning full synthetic provides low smoke and smell. Outstanding detergency keeps engine clean of deposits and rings free, to maintain ultimate power and performance. Maintain peak engine performance and reliability Meets or exceeds manufacturer’s warranty requirements. Using this product will not void manufacturer warranties. 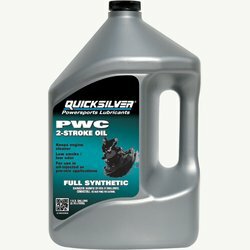 Why PWC Specific Oils are Important? 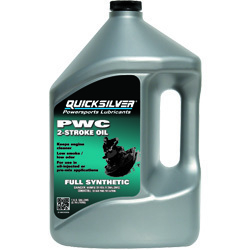 Quicksilver Full Synthetic 2-Stroke PWC Oil is a low smoke/low odor formulation which keeps your engine cleaner. Exceeds manufacture and industry specifications and recommended in all major OEM brands.